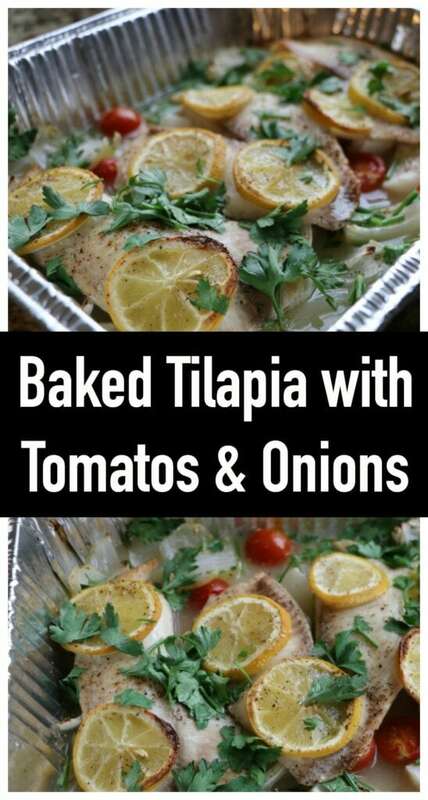 I really love this baked tilapia recipe and I hope you will too! I’ve been focusing on a lot of fish lately, right? I’ve made a real effort to cook more of it at home this year – as you can tell. But all of my recipes have to be quick and easy – that’s my rule. I don’t have time to dedicate to meal prep and the last thing I need is a house that smells like FUNK. Instead, I opt for great tasting recipes that are manageable and fuss-free! 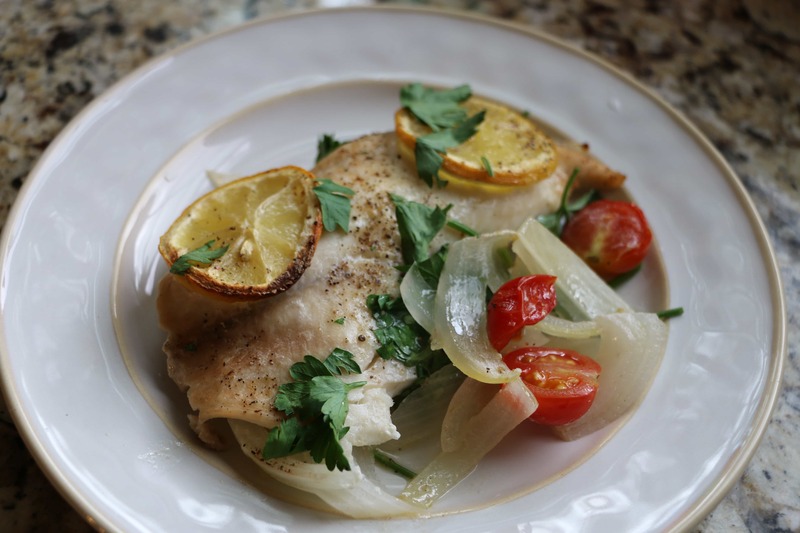 Today’s post is all about a go-to dish that I turn to over and over again – Baked Tilapia recipe with Tomato and Onions. This is a recipe that was given to me by my mother and grandmother. They are Maltese and make fish quite often. 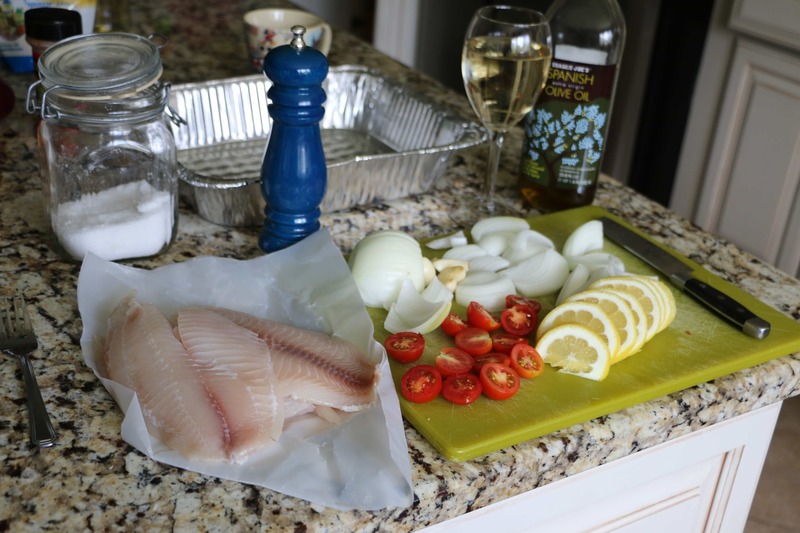 Tilapia is a fish that is easily and readily available. So, we ate it often growing it. My mother was notorious for throwing a few ingredients together in a pan and then roasting it. 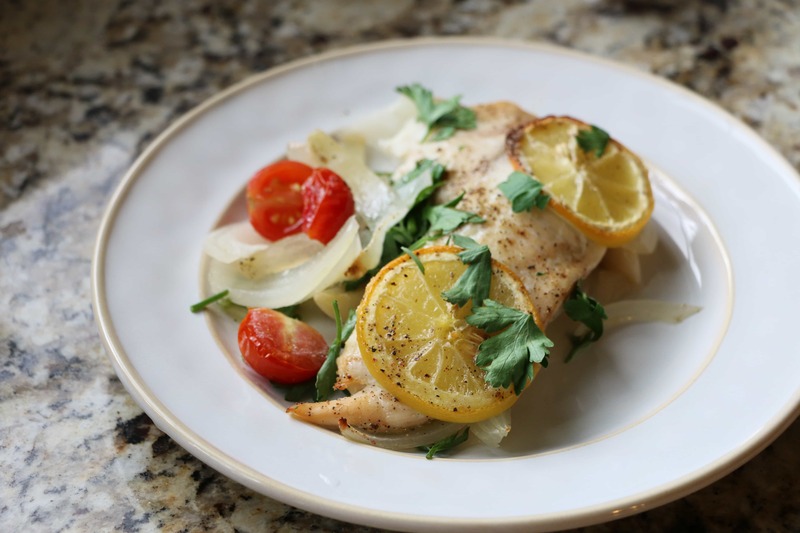 This baked tilapia recipe falls into that mix. A little bit of this and a little bit of that. A very Mediterranean vibe for sure. The flavors are fresh and simple – and that’s how I like it. I put together this ingredients list for your reference, but usually, everything I do is a rough estimate. A handful of tomatoes, a small onion, a handful of garlic. I cook by feeling and based on whatever I grab. But I think this is a good estimation of what you need to make this meal. 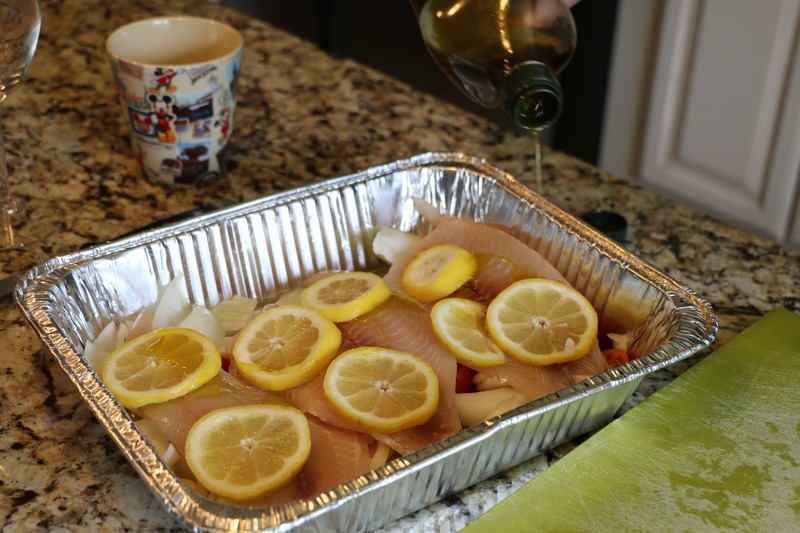 Place olive oil and 1 tablespoon of wine on the base of your baking dish and combine. Throw in onions, garlic, tomatoes, salt, and pepper and then mix. 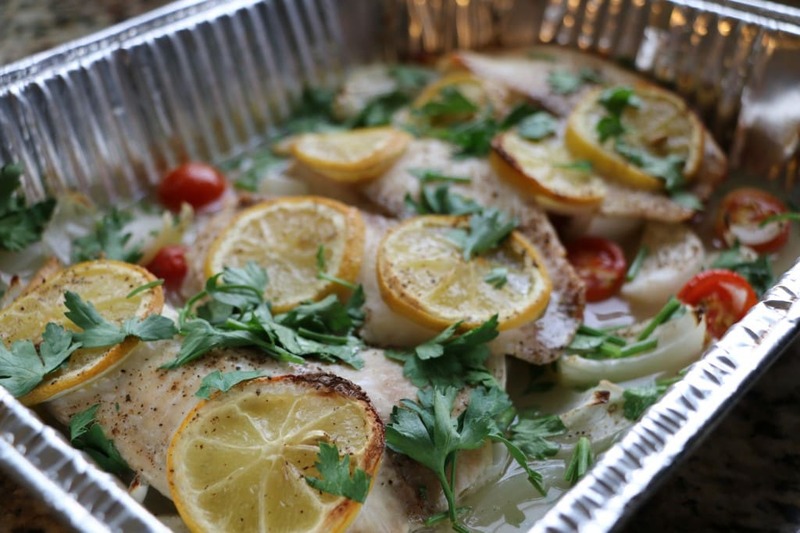 I like to use a disposable tray when I cook fish, but that’s just me. Makes it easy to throw everything away as soon as we are done serving. This also helps get the fish smell out of the house quicker. Lay the tilapia on top. Season the fish with salt and pepper. Pour the rest of the wine over the tilapia and arrange lemon slices on top of the fish. Baked the tilapia uncovered for 45 minutes. Before serving, sprinkle parsley over dish. If you’d like, you can cook the dish with the parsley – up to you. You would add it with the onions if you want to cook with the parsley instead of serving at the end. 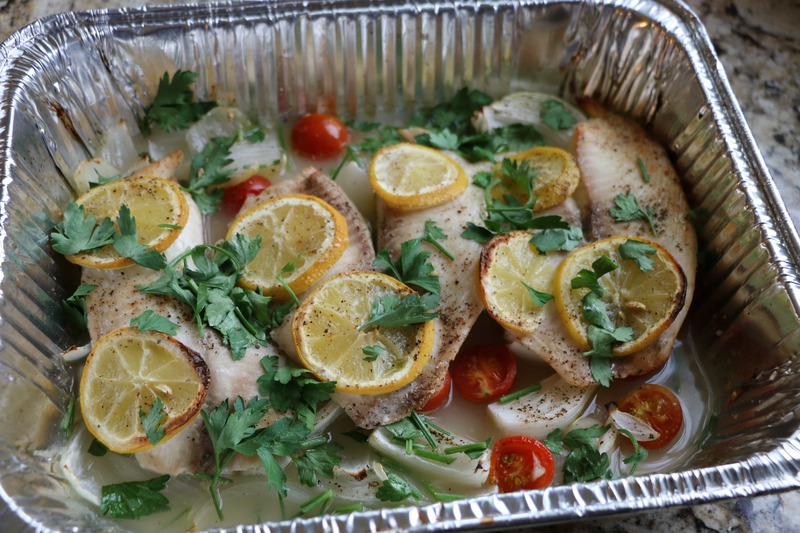 What do you think of this baked tilapia recipe? It’s super easy to make, right? The whole thing will take you about an hour to make – soup to nuts. You can serve it with white rice or potatoes. Even a simple side salad would do. Baked tilapia is relatively low in calories (130 per 3.5-ounce serving, cooked) and rich in protein (26 grams). So, it’s a great option to make about once a week. To see what Audrey cooked up this week for ‘Getting Gorgeous in the Kitchen’, click here.